This head hugger style hat is close fitting and textured. 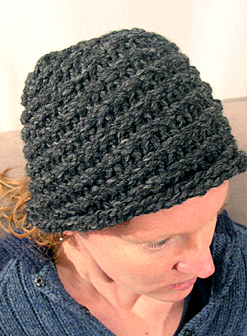 The special top closure technique allows the hat to hug the head without the bunchiness of traditional loom knitted hats that have the gathered bind off closure. The hat pictured is made using Lion Brand Wool Ease Thick N' Quick yarn. This hat would make a great chemo hat gift for charity or for a friend in need. Choose a softer chunky yarn for delicate scalps. Color pictures with detailed written instructions are included in the pattern. Stitch Techniques: E-wrap, purl, flat stitch, whip stitch and a modified flat panel bind off.